In case you’re not aware, the next six months are going to give us a lot of ways to experience Magic that are not Standard-legal booster packs. Yes, that’s only one week between an FtV and the new Conspiracy set. My wallet already hurts. Notably, this list leaves out Eldritch Moon (July 16) and the next large set (codename is Lock, due to land in September 2016) but those are less likely to have reprints in them. FtV: Lore is something I don’t want to speculate on. I don’t think I’ll ever recover from Wizards’ decision to put Iona, Shield of Emeria in Modern Masters 2015 and then immediately again in FtV: Angels. I know there’s some logic, some rationale, but I’m done trying to predict what they will and won’t do. Instead, I want to think about what’s safe, as I attempt to weather the storm ahead. I also want to consider the three reprint-focused sets (Conspiracy and Commander are mostly reprints) and what I have that’s exposed from a financial standpoint. One of the things that I have learned is to trust the high-end market. The things that there will not be any more of, that’s only going to go up. There are blessed few examples of a three-figure card crashing down to earth, and those usually involve multiple bannings. 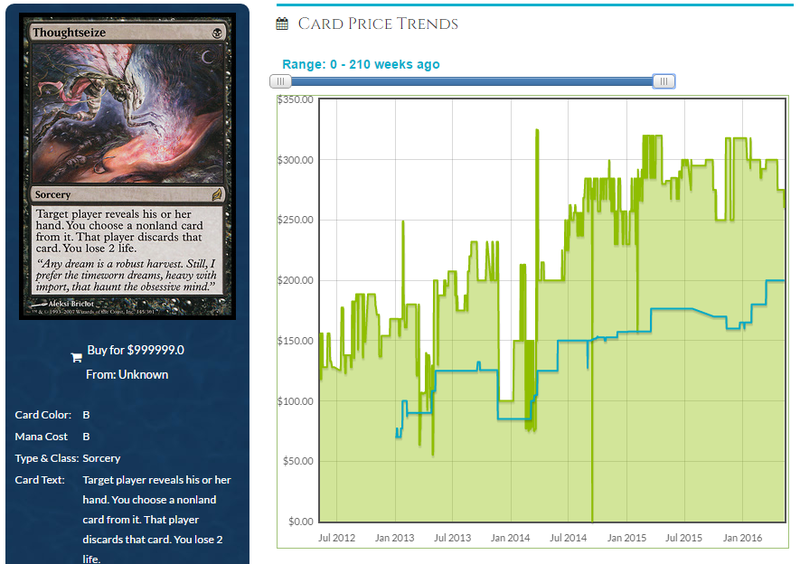 Theros came out in fall 2013, and you can see the dip down to about $100. If you got in at that point, congratulations. 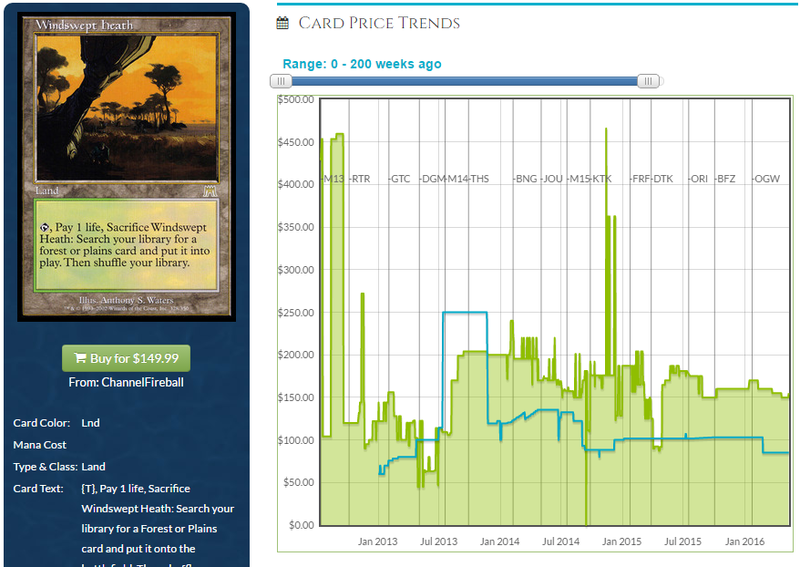 I love it when any card triples in value, but climbing $200 or so is truly awesome. In retrospect, we should have seen it coming. We should have known that this card is good. Incredibly so. Format-warpingly amazing. It’s a mainstay in Modern and Legacy and while lots of people were telling you to pick up $20 copies at the end of Theros, I don’t remember many voices chiming in about Lorwyn foils. Original set foils are resistant in the long term, often carrying more value than newer versions that seem exactly the same. Woodfall Primus, a fun reanimation target but not a Constructed card currently, has a $6 gap between the Shadowmoor foil and the Modern Masters 2013 foil. While it’s seen some ups and downs, it’s been mostly at home in the $150 range. This is true for the other four, and now my secret: GET THESE NOW. No matter which version you want, supply is at a peak. If you ever wanted these for a Commander deck, or your Cube, or whichever, now is the time. People have gotten theirs and they are coming out of circulation and there’s nowhere to go but up. I like the set foils and the Expedition versions to grow the most in the next two to three years, but these will, at the worst, keep their price. On a related note, I really, really like getting into foil Zendikar fetches. These might not get the Standard treatment as the Onslaught ones did, but the trajectory is there. Buylist on a foil Scalding Tarn has already gotten back to where it was before the Expeditions landed, and I think that all the foils are going to tick steadily upward. At worst, they stay safe, and I’ll be insulated against all the reprints that are coming. Now, let’s talk about some unsafe cards. Nykthos, Shrine to Nyx ($8): This worries me, and I have about 20 that I picked up for $4. It’s too easy. This shines in a set that focuses on individual colors, or hybrids. I’ve seen some chatter that an Elf theme is quite possible in EMA, and this fits in very well as a “Oh, you’ve done a bunch of stuff? Have a boatload of mana!” card that Gaea’s Cradle is ideal in. Thespian’s Stage ($3/$14): The foil multiplier is due to the Dark Depths combo and the awesomeness in Commander. I banged the drum on this card for years as a dollar pickup and here we are, a triple up…and I’m frightened. There’s a lot of people on PucaTrade who want this, and in the interest of disclosure, I sent out half my copies this week. A reprint, in any set, will send this back to fifty cents or lower, and it fits literally anywhere. Stony Silence ($11): Cheap, easy, and a great answer to a lot of problems. I’ll be surprised if this hasn’t had a new printing by the end of this year. Innistrad enemy check lands (Sulfur Falls, Woodland Cemetery, etc. ): These have had one printing and it was five years ago. It’s time and the values will drop by at least half. Lots of spare copies have been soaked up by the casual market, and they are a great add for easing mana fixing. Craterhoof Behemoth ($26): A great finisher for swarm decks, this might be too obvious if there is an Elf theme in one of the reprint sets. I don’t think they want to take an Elf deck and reprint it as-is, but as I said, I’ve been horrifically wrong about what Wizards will and won’t do. Rise of the Dark Realms ($7): Big, expensive, splashy, and usually game-ending. Sounds like the definition of a card in Commander 2016. Primeval Bounty ($6): Whatever you do after casting this, it gets significantly better. But it does nothing at six mana, yet it’s got this price. Ripe for reprinting! Omniscience ($16): Another excellent candidate for a Commander reprint, it’s just silly, especially if the Reserve List gets bent and best buddy Academy Rector gets a reprint along the way too. 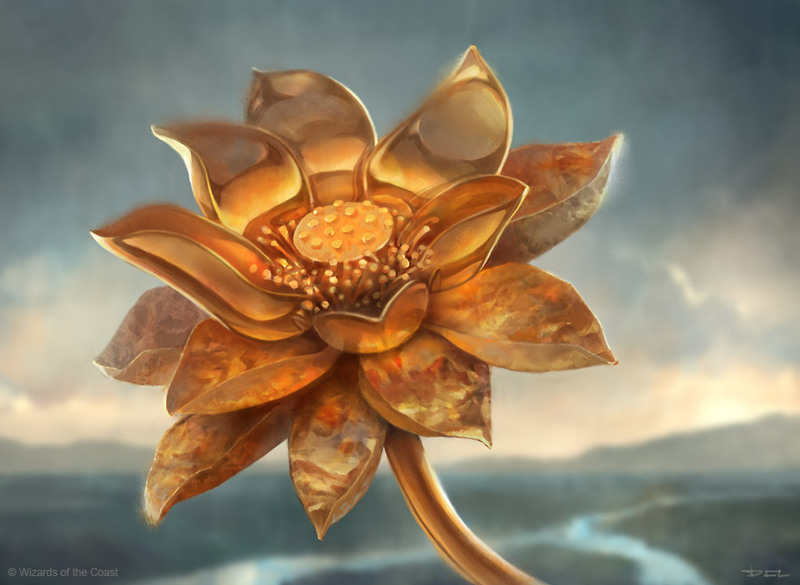 Gilded Lotus ($9): Don’t sleep on how good this card is, because it’s been in two large sets and as an FtV and yet it’s still here at $9. It’s a first-pick card in Cube too. There’s a lot more things that I don’t want to have spares of, and I’ll try to wrap up the list next week. Feel free to add your thoughts in the comments or the forums!